Common millipede on carpet. Photo by Diana Pounds. Millipedes are common arthropods found in damp locations where they feed on decaying organic matter. 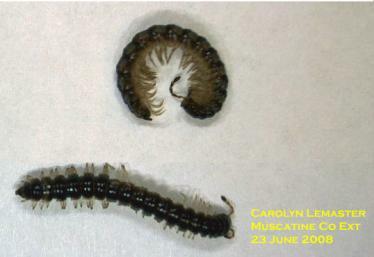 Millipedes are are beneficial as "recyclers" as they break down decaying organic matter. Millipedes are not harmful; they cannot bite or sting and they do not attack people, property, possessions or pets. Millipedes live outdoors or in damp locations such as greenhouses and hide during the day under leaves, needles and dead plant debris, or in cracks and crevices. They are most active at night when the humidity is higher or when dew is present. Millipedes have an elongated, worm-like body with two pairs of short legs on the underside of almost every body segment. The common millipede is approximately 1 inch long with a hard, rounded, cylindrical body that is brown to blackish in color. They have short, inconspicuous legs and they usually coil into a spiral when handled or disturbed and when dead. The garden or greenhouse millipede (also called flat-backed millipede) is often abundant in greenhouses (as the name implies) but is also found in potted houseplants and may live outdoors in damp areas. The garden millipede is different from the more common millipedes by being moderately flattened from top to bottom and lighter colored. The legs are fairly prominent. Flat-backed millipedes have small "flanges" or ridges along the sides of each body segment. Millipedes spend the winter as adults, hiding in protected locations. Eggs are laid in the soil or under decaying organic matter. Young millipedes that hatch from eggs resemble small, shorter versions of adult millipedes. The immature millipedes grow gradually in size, adding segments and legs as they mature. Growth and development occurs in damp areas with decaying organic matter. Millipedes can not reproduce indoors. 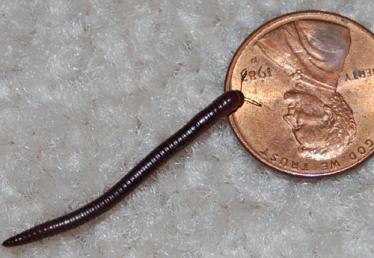 All millipedes found inside wandered in by mistake. Millipedes are harmless; they do not feed upon building structures or furnishings and they cannot bite or sting. However, millipedes can be annoying as accidental invaders in houses and other buildings when they migrate into buildings over night. Millipedes are usually found in the garage, basement or lowest level although they may wander into other parts of the house. Millipedes in greenhouses, gardens and potted plants may be annoying but do not feed on the plants unless the plant is laready damaged or decayed. Controls for millipedes are aimed at keeping millipedes outdoors or reducing their numbers at the source. Cracks, gaps and other points of entry around windows and doors and in foundation walls should be sealed if possible. Removing organic matter such as plant mulch and dead leaves from against the house may help, and damp conditions around the house foundation should be corrected. Insecticides are of limited benefit in controlling millipedes because of the protected areas where they originate and because of the long distances they migrate. In warm weather when millipedes are actively wandering, residual insecticides can be applied in a 5- to 20-foot wide barrier around the building to reduce entry. If practical, also spray areas where the millipedes likely originate. Thorough application will aid in control, but reliance on chemical control alone is often unsatisfactory. The control treatments must be thoroughly applied in such a way as to get the insecticide down to the soil surface. For more information on insecticides please see this article. Millipedes migrate long distances during certain times of the year (varies with the weather, but commonly in spring or fall). Therefore, actions near the house may have no effect. Some sources of millipedes such as woodlands and crop reserve program fields can produce extremely large numbers of millipedes that invade from distances of 50 feet or more. The indoor use of household insecticides provides little if any benefit. Millipedes that wander indoors usually die in a short time because of the dryness, and spraying cracks, crevices and room edges is not very useful. Sweeping or vacuuming up the invaders and discarding them is the most practical option. Control of greenhouse millipedes requires locating the source of the infestation. Check under benches and in houseplants and damp areas. Millipedes discovered during the summer may originate outdoors under leaves and mulch, in window wells and similar locations. If houseplants are infested you may decide to discard the plants. For plants you wish to save, remove any soil-covering mulch or moss and allow the potting soil to dry out as much as the plant can withstand between waterings. The soil surface, cracks along the edges of the pot and the area between the pot and saucer can be sprayed with a houseplant insecticide to further help eliminate millipedes.